Whilst many of our residents have lived in the village for many years, new families are always moving in. Several years ago the Parish Council decided that as a ‘Welcome’ to our village we would produce a booklet full of useful information from where to find the doctor’s surgery or a beautician in the village, to the location of the nearest petrol filling station as well as details of transport links with Basingstoke and places of interest in the surrounding area etc. This has recently been updated to include website addresses of local sports facilities, cinemas, theatres etc. The handy A5 booklet together with an A4 map backed with a street index of the village, a copy of the village magazine – Link, leaflets advertising several organisations in the village, the details of refuse collection and recycling and bus time-tables are placed in a handy plastic wallet. Through a network of volunteers, the Parish Clerk is notified of any new family in the parish. Once alerted a Parish Councillor will call to introduce themselves and to deliver their Welcome Pack. 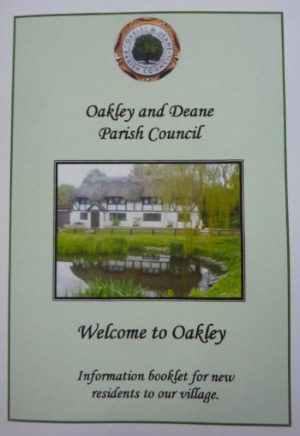 If you are new to the village and no-one has called on you or are about to move to Oakley please do not hesitate to telephone the Parish Clerk, Barbara Bedford on (01256) 780886 and she will pass your name to a nearby councillor.